Inventory We are a resale marketplace, not a box office or venue. Ticket prices may exceed face value. This site is not owned by Hard Rock Stadium . The Hard Rock Stadium, formerly Dolphin Stadium, Pro Player Stadium, Land Shark Stadium, Sun Life Stadium, and The Orange Bowl with all of these names who could possibly keep track of what it is called today. 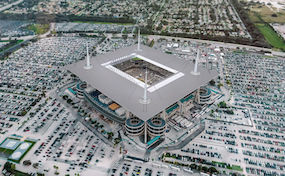 The things that have remained constant are the fact that the Miami Dolphins have played every game here, Also the Orange bowl has been played and determined National Champions in the past. Hard Rock Stadium has also hosted some fo the greatest Super Bowl matches of all time. The University of Miami has been playing thier games here for a while as well. Not to be left out but just a few years ago the Florida Marlins won a World Series here. With all of these historical events there no wonder why people come from all over the world to see Hard Rock Stadium. StadiumMiami.com is not affiliated with any primary box office or supplier. We are a privately owned and operated business specializing in sales in the secondary market. To buy tickets for any Hard Rock Stadium events in Miami simply click on the event of interest or call our operators at anytime.